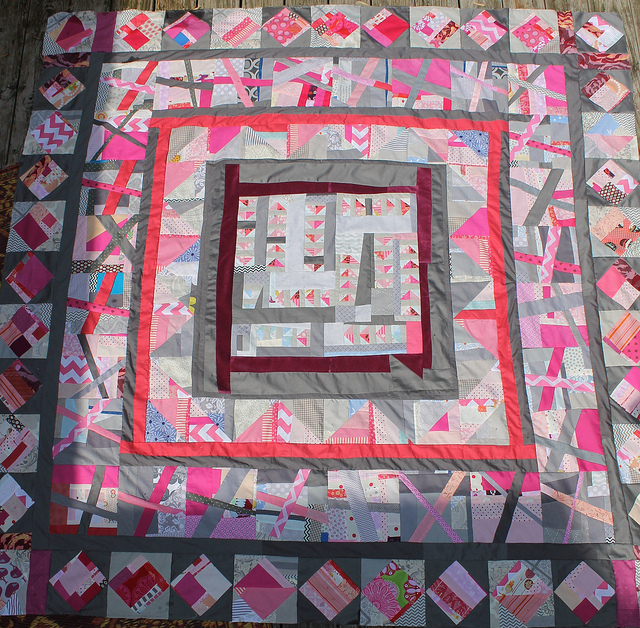 This is my other entry into the Bloggers Quilt Festival – this one is going in Scrap Quilts! 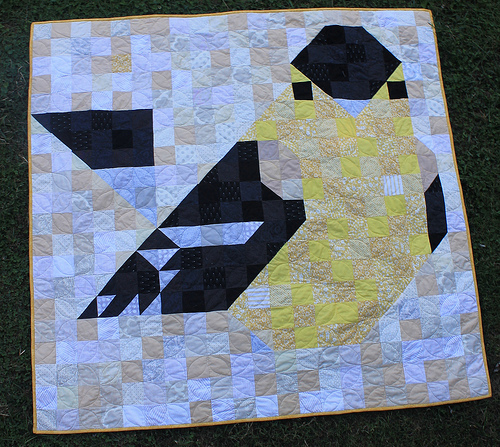 I used all the trimmings from my Bronte Flying Geese Quilt and sewed them together in a long line. This was incredibly satisfying. 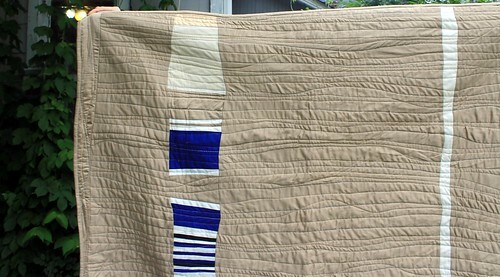 It give the quilt a great texture with all those million seams. 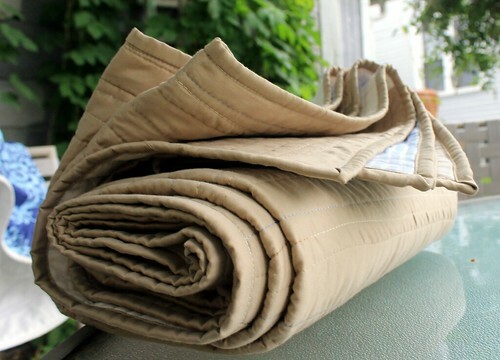 The rest of the fabric is also actually scraps – beige leftover from sheet I used for the backing of a queen size quilt. Obviously pieces that size could have been used for anything, but you know. 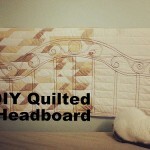 The white strip was trimmed off the edge of a quilt as well. 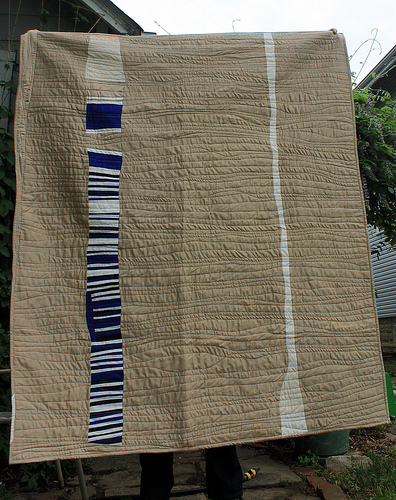 I quilted it using three types of thread – a blue to white variegated thread (sulky), a brown to white 17 wt. 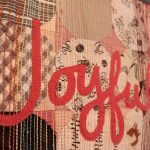 variegated thread, and my trusty 50 wt beige from Aurifil that I use for about everything – including all the piecing and it is pretty much always in the bobbin. 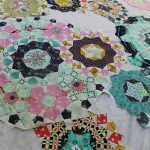 This was such a party to quilt. I just had the pedal to the metal as I wanted wavy organic lines so it went incredibly fast. 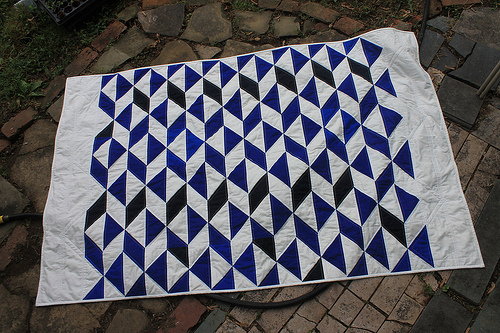 I had originally wanted denser quilting but it was starting to feel stiff so I called it. 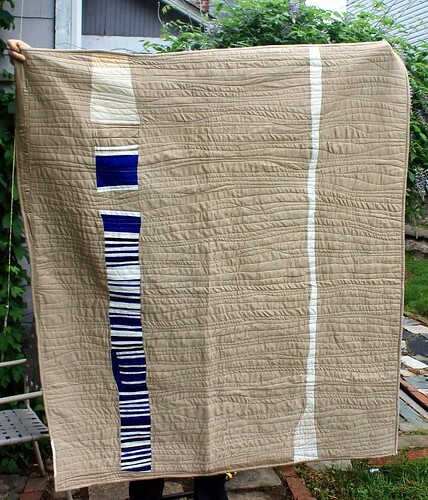 The back is more organic target sheet scraps and part of an old target shower curtain. Boy, this is just a Target advertisement at this point! I actually got them used a Goodwill, but they were born at Target. I left the sides wavy as well. I was all set to square it up, but I decided I liked it. They were wavier before I put the binding on, which tamed things down a bit. 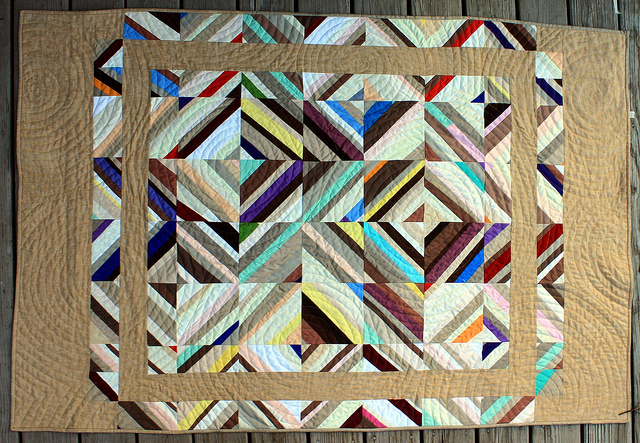 I’m not sure if you can tell how nice and shiny textured this quilt is. 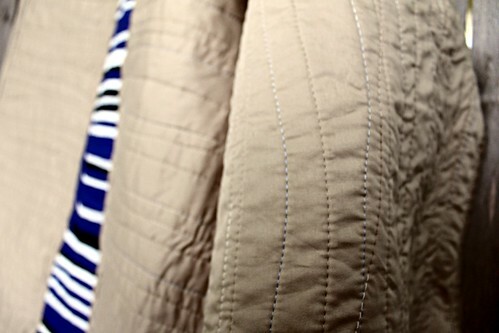 The satin finish of the sheet with the wavy quilt lines pretty much force you to touch the quilt. 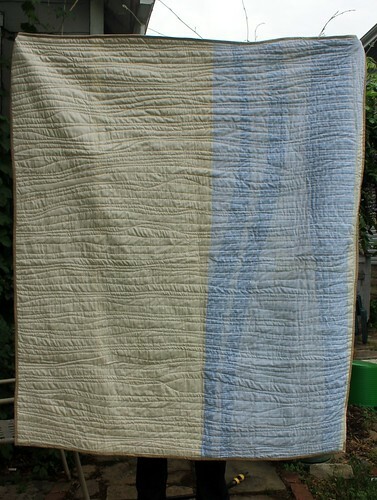 I love the organic, natural feel to this quilt, especially with that quilting and the wavy edges! It doesn’t look like scraps at all – it looks marvellously intentional for an improv piece! Beautiful. Oh, I love this! What a great way to use up your scraps – it looks very intentional. 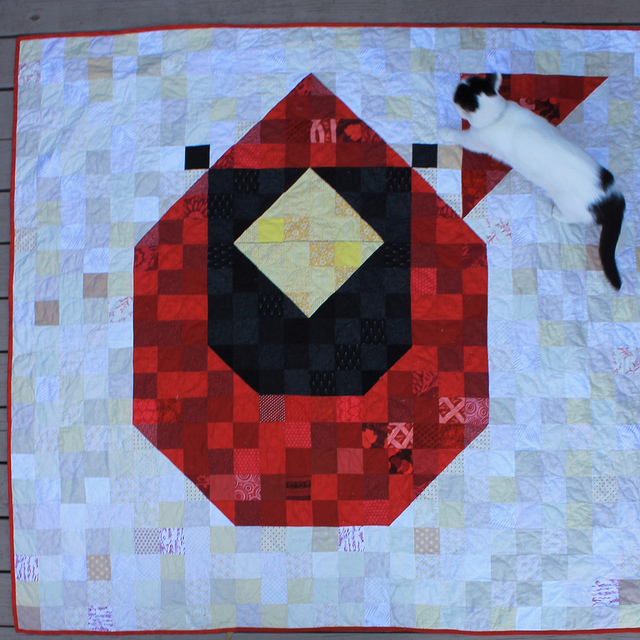 And I love your quilting. Great job! I just voted for this! 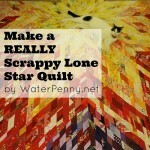 LOVE all your quilts! YUM! Creative, original and great knack for color choices!